Back Bay becomes home to John Hancock – 2.0. The insurance company is returning its headquarters to Back Bay, where it already has a 1.2M SF campus and employs over 2,000. Its 465K SF Seaport headquarters at 601 Congress St. employs 1,100 people, all of whom will be transferred by the end of 2018 to two Back Bay buildings at 200 Berkeley St. and 197 Clarendon St., the Boston Business Journal reports. [John Hancock CEO Marianne] Harrison sent a memo to Hancock employees Tuesday, saying the company had enough space in Back Bay, given the number of local employees and how many work remotely. Along with the weather beacon-capped 200 Berkeley and 197 Clarendon, Hancock has approval to build a third office tower in Back Bay. The 26-story, 388-foot tower at 380 Stuart St. could be developed for Hancock or another tenant. Our city continues to grow up. Literally. 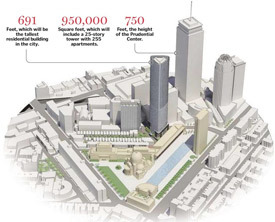 The newest building approved in Boston is 691 feet. The tallest current building in the city is the John Hancock, at 790 feet, built in 1976. 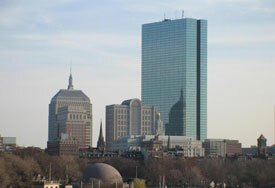 Coming in second is the Prudential Tower at 750 feet, built in 1964. The only building to make the list and built in the 80’s, was One International Place at 600 feet built in 1987. From 1987 to present we have not seen any new construction over 600 feet. Currently there are three projects that are all 600 feet plus. Jump over to the Boston Globe’s website to read the full editorial. Will Back Bay be home to another Boston Properties skyscraper? 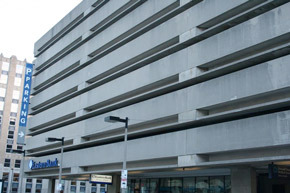 The location would be atop the John Hancock garage at Back Bay Station.